Original post: Jan. 30, 2014. Updated: April 27, 2017. Global heating and climate disruption has already forced Arctic sea ice into a new state of ‘death spiral’ meltdown and it is anticipated to disappear in Summer months within a decade, or even a few short years, many decades ahead of previous estimates. This has ALREADY had domino effects. The air conditioner of the northern hemisphere and a major global weather regulator, it has lost 80% of its volume, almost 50% of its long-term (1979 – 2000) average extent since 1979 (watch video) and rendered the jet stream much slower, wavier, weaker (watch video) / prone to cause more extreme / prolonged weather events (storms, floods, droughts, wildfires). The Arctic hasn’t been ice-free for somewhere between 1,450 and 4,000 years, and before that, for about 120,000 years. And a new study concludes that the last time Arctic temps were this warm was at least 44,000 and, perhaps, as many as 120,000, years ago. Not included in any of their future scenario calculations, this omission alone renders many of the IPCC conclusions (Intergovernmental Panel on Climate Change, the primary basis for policy makers, politicians, governments and business leaders in the development of corporate strategies, all international (U.N.) climate negotiations and, now, toward a (supposed) new climate deal in 2015) to be dramatic underestimates. And a new study has shown that, at as little as +1.5ºC of global average surface temperature increase (since pre-industrial times / pre-1900 / we’re at +0.85ºC now), the release of large amounts of methane — as much as 100 billion tons of carbon by 2100 — could become (in ecoSanity’s words) a blow torch accelerator of rapid, unstoppable, irreversible (self-perpetuated / reinforced) heat feedback. Put another way, this would be ‘GAME OVER’ ON A HORRIFIC SCALE for most life, and would persist long beyond any relevant human time frame. ► Methane is a carbon molecule 86-100 times more potent as a global warming (heat-trapping) gas than CO2 over a 20-year time horizon. It remains in the atmosphere for about 12 years, over which time its heating impact is 100 times that of CO2, and only disappears as it is converted to other greenhouse gases (GHGs), the most notable, CO2. 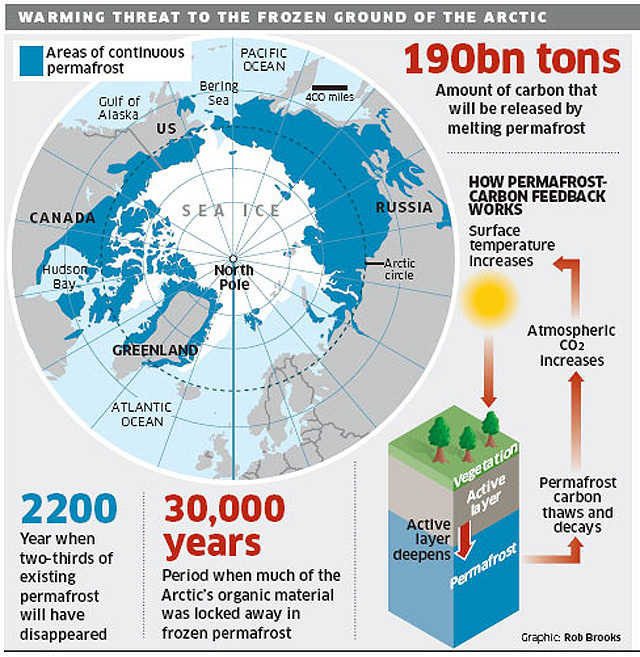 ► Permafrost contains TRILLIONS OF TONS of frozen carbon, at least twice as much as is in our entire atmosphere. This important 2013 study concludes that Siberian permafrost has a ‘thaw down’ tipping point of +1.5ºC (of heating since pre-industrial times, pre-1900), which means that a global climate not much warmer than today (+0.85ºC) appears to be sufficient to melt significant regions. 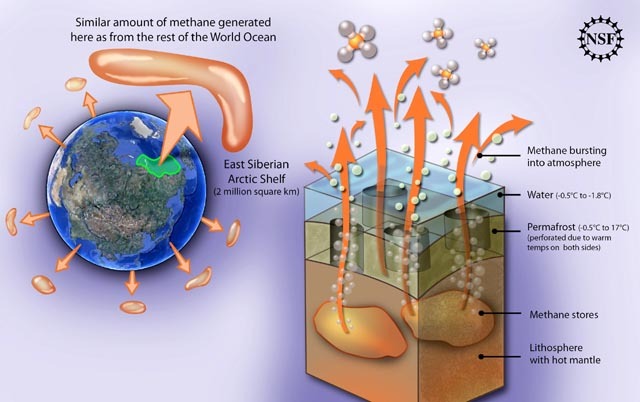 And THAT makes East Siberian shelf sub-seafloor methane a massive, planetary catastrophe risk. ► Melt / destabilization ALREADY causes more and more methane to vent from its safe, frozen state every year. ► On our present course, and based on conservative estimates, an IRREVERSIBLE carbon tipping point could occur within 20 years (between 2020 and 2030). ► This could result in the release of at least 100 BILLION tons (a lot) of carbon by 2100, and two thirds of stored deposits by 2200. ► NO climate models to date incorporate consideration of the various amplifying and inter-reinforcing Arctic feedbacks (loss of sea ice-albedo, warming northern peatlands, methane release from permafrost melt, methane clathrates from the melt of ocean floors, nitrous oxide feedback, soot) nor do they evaluate their combined impacts. ► CO2 emissions are cumulative, which is BAD because, even if we could reduce them to zero this minute, inertia from the 30 to 40-year lag between the release of heat trapping gases and the lifetime of a major proportion of CO2 emissions (the primary source of inertia based on the time it takes for that energy to force itself into the climate system / 90% oceans) would continue to warm the planet. Global average temps would still rise for decades and any reduction from a future peak (if a runaway tip was somehow avoided) would take hundreds of years. Watch the videos in the playlist above. Further info in the resources below. And for a few specifics about what climateye has concluded must be done in order to have any chance to prevent imminent catastrophe, see: Compilation: Geoengineering and the global climate EMERGENCY.